Recently Iran authorities have intensified their crackdown on journalists, women and minorities such as the Ahwazi Arabs. These observations led Amnesty International to refer to 2018 as the “Year of Shame” for the Islamic Republic of Iran. The mass arrests are ongoing and, according to the Human Rights Organization of Kurdistan in Iran and the Kurdistan Human Rights Network (KHRN), more than 100 environmental and civil rights activists have been detained, summoned or arrested in Kurdish areas since the beginning of 2019. According to Kaveh Kermanshahi, the speaker for KHRN and a consultant at Berlin-based LesMigraS, “the new wave of arresting activists in Kurdish cities is alarming and 2019 may be the worst year for activists in Iran.” Kermanshahi thinks that the silence of the Western media on this issue emboldens the Iranian government. “Tehran starts to arrest activists, and as the media in the West do not react, security forces then widen their mass arrest operations across the region,” he says. One of the most disturbing aspects of these mass arrests has been the routine torture of detainees and the ensuing forced confessions. Torture in Iranian prisons has always been rampant, aimed at extracting false confessions to be broadcast on state television. The Iranian government favors this method for two main reasons. First, to legitimize its claims that activists are all agents of foreign countries. Second, to break the will of those who oppose the policies of the government. 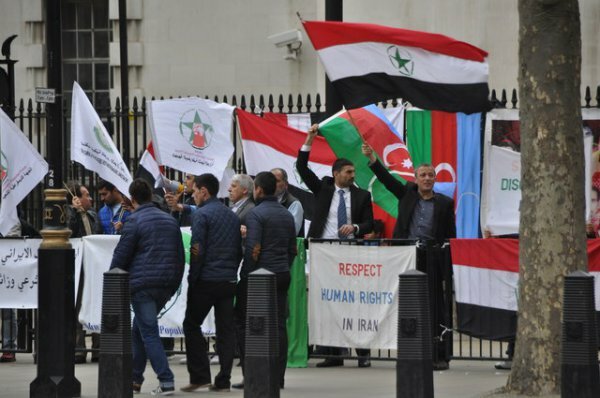 “The Iranian regime’s violations of human rights in Ahwaz are so widespread that many Ahwazis have resigned themselves to joking that there are no rights left to be violated. Prisons are flooded with dissidents and the increasing amount of protests against the government have resulted in extreme measures against Ahwazi Arabs,” says Rahim Hamid, an Iranian journalist. Amnesty International’s findings, as well as reports by other human rights organizations, prove that the situation in Iran has deteriorated under President Hassan Rouhani, who is widely considered to be a moderate. Despite this, his foreign minister, Mohammad Javad Zarif, has repeatedly claimed that Iran does not have political prisoners — although he only does so when speaking in the West. However, the documented reports demonstrate the opposite, and data from the likes of the Committee to Protect Journalists (CPJ) is in sharp contrast with Zarif’s assertions. Iran habitually makes the CPJ’s top 10 most censored countries list and was the in eighths place for the number of journalists imprisoned in 2018 (down from first place a decade ago.). This may not be the last year of shame for Iran because, inevitably, as more protests occur, the more arrests and torture of dissidents by security forces are bound happen. These human rights violations have always been justified by sentences given to opponents of the regime. For instance, the Islamic Revolutionary Courts of Iran have sentenced 61,000 activists and political figures to death since the 1979 Islamic Revolution — all the sentences have been carried out. Moreover, more than 300 Iranians have been assassinated abroad by the Ministry of Intelligence of the Islamic Republic of Iran. Shameful statistics like this is what has led the majority of Iranians and observers who have been following Iran closely to believe that the regime in Tehran cannot be reformed, and that the only option to end this misery is regime change coming from within, with the support of the international community.